According to the Socialists that have embedded themselves in our media and pretend to be neutral arbiters and reporters of the truth but are really hell-bent on tearing down anything with virtue and replacing it with anything without, they find General John Kelly, the former Commander of Southern Command, Gold Star father and now Chief of Staff to the President, to be just about the worst type of human being on the planet....next to Donald Trump. Let me suggest that not a one of them could carry this distinguished Patriots combat boots and for them to speak of him with such vulgarity speaks not to General Kelly, but rather to their lack of integrity, a moral compass, and a dead man's soul. -W.E. John Francis Kelly (born May 11, 1950) is the current White House Chief of Staff for U.S. President Donald Trump, previously serving as U.S. Secretary of Homeland Security in the same administration. 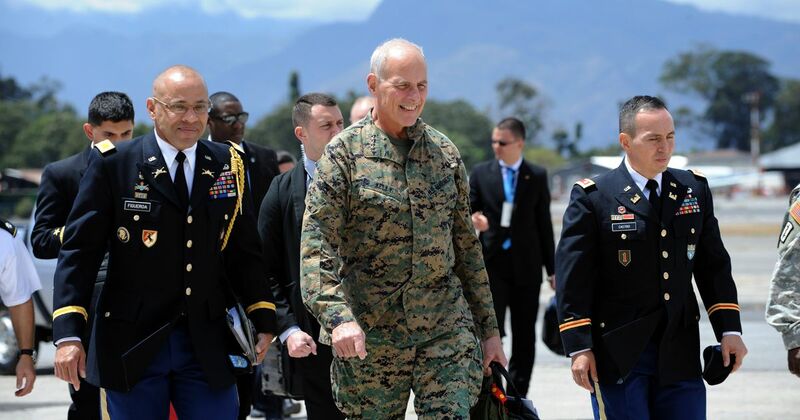 Kelly is a retired United States Marine Corps general and the former commander of United States Southern Command, the unified combatant command responsible for American military operations in Central America, South America, and the Caribbean. Let’s take the CNNers who weren’t able to participate in the CNN Newsroom berating of Kelly immediately after he left the White House briefing room. Arguably the most distasteful tweet came from failed MSNBC host Keith Olbermann (who currently hosts of GQ’s The Resistance. Olbermann noted that Wilson was a family friend of Sgt. La David Johnson, but he refused to stop there, referring to Kelly as a “collaborating, enabling nitwit.” So despicable. Toronto Star journalist and far-left darling Daniel Dale also brought up the relationship between Wilson and the Johnson family but, like Olbermann, he couldn’t end his comments there. And those tweets were only small sampling of the venom out there for an American hero and treasure. Simply because of his political affiliation, Kelly was dragged through the cesspool of American political discourse. So, the question that Kelly and so many others have asked in the past few months is this: Is there nothing left that’s sacred? Well, after Thursday and the instant jump to attack Trump for something neither side has handled (as in the issue of Gold Star families), the answer has proved to be a depressing no.